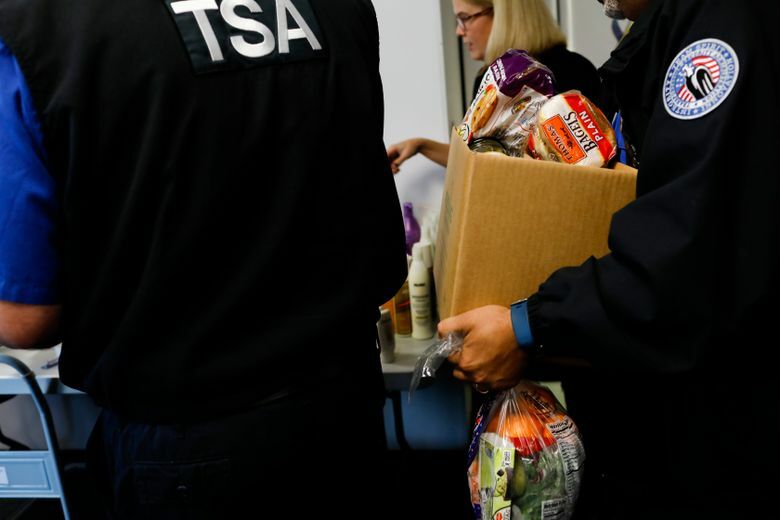 TSA workers pick up food and other items at a temporary pantry at the police training facility at the Tampa [Florida] International Airport on Jan. 14, 2019. (Photo for The Washington Post by Eve Edelheit). Significant numbers of TSA agents have not been coming to work, either because of financial hardship or to underscore their opposition to being forced to work without pay. And the agency said the call outs are rising. Significant numbers of TSA agents have not been coming to work, either because of financial hardship or to underscore their opposition to being forced to work without pay. And the agency said the call outs are rising. TSA officials would not provide specific employee totals, citing security concerns. But “the number of people calling out because of financial concerns is increasing,” said Michael Bilello, TSA’s assistant administrator for public affairs. Numbers from the agency, covering Tuesday, show 6.1 percent of employees did not come to work. That’s nearly one out of every 16 workers, and a 65 percent jump in call outs from the year before. TSA said the call outs have forced three major airports – Atlanta, Houston and Miami – to operate under contingency plans meant to address various disruptions. In this case, the disruption is the partial shutdown over President Donald Trump’s push for billions of dollars to build a border wall. Miami temporarily closed a terminal and Houston has been operating with a major checkpoint closed. TSA Administrator David Pekoske last week used existing TSA money to pay workers who reported on Dec. 22, the day after the shutdown began, and to provide them with a $500 bonus for their work over the busy Christmas holiday. His effort to provide cash to his staff was intended to tide them over as they worked without pay, though officials acknowledged it is not nearly what they are owed. Still, “they should all have [the money] by Friday via the direct deposit system,” TSA spokesman Jim Gregory said. As the political impasse continues, the Trump administration has also recalled thousands of furloughed safety workers at the Federal Aviation Administration. But outside experts said the U.S. aviation safety system remains under significant stress, and that risks of errors are increasing as the shutdown persists. Members of Congress have been pressing the administration about such risks, but the deadlock remains. Sen. Edward Markey, D-Mass., sent a letter Wednesday to acting FAA Administrator Daniel Elwell pointing to the “financial insecurity” facing thousands of air traffic controllers going without pay. That, “coupled with the increased hours some controllers are reportedly working to cover for existing staffing shortfalls, may introduce unnecessary stress to this high-risk job, potentially increasing the likelihood of mistakes,” he wrote. Markey asked whether the FAA’s decision to recall thousands of safety inspectors will allow the workforce to conduct “all necessary” inspections, what steps the FAA is taking to retain controllers – more that 1,800 of whom are eligible to retire – and what steps are being taken to replace potential retirees. “The American people need to know that their air travel remains safe,” Markey wrote.